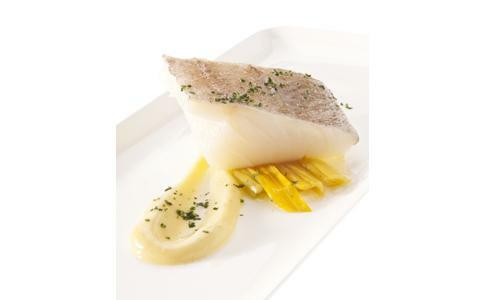 Confit cod with "pil pil" sauce and roasted "calcots"
Put in a pan some sunflower oil, add the garlic heads cuted in half and raise the temperature until golden brown the garlic. After browning the garlic, add extra virgin olive oil out of the fire to prepare the frying. Keep 8 hours at 60 degrees for infusions. Preserve it. Thoroughly clean the bones and skin of fish. Boil with water, strain and reduce liquid until a gelatinous consistency. From the warm jelly cod whip the pil-pil sauce. Incorporate a thin stream of garlic oil and stir.